Through the remaining winter months I am going to start a regular series of posting a picture or two (or three) somewhere in France, Belgium, Switzerland, or Italy, and letting you try to guess of what and where the picture was taken. You can expect these posts every Friday. The scenes will be a mix of cycling landmarks and cultural landmarks. The day after Christmas I watched the movie Midnight in Paris with my brother and his wife. Behind the opening credits rolled scene after scene of famous sites in Paris. My brother said, "okay, we have to try to name every site." And so began a continuous shouting of location names at the TV as they appeared on the screen, we didn't miss one. Not only was it good entertainment, it felt like we were there, and for that moment we shared the memory of being there. This fun coupled with the fact that my niece, who is studying architecture for the year in Florence and Switzerland, and my nephew (the professional triathlete in his off-season) are currently traveling through England, France, and Italy together and have been sending home wonderful pictures and commentary - inspired this idea. I love being an arm chair traveler in the months when I cannot travel myself. Actually I like hearing anyone's travel stories any time. Chances are if you visit this site - you have the travel bug too. 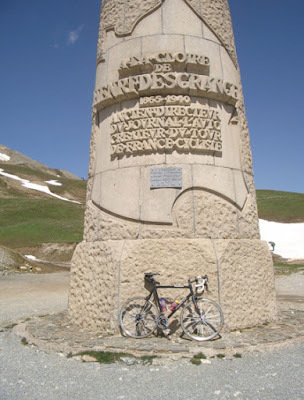 This monument to the creator of the Tour de France is located on the Col du Galibier in the French Alps. The memorial was placed on July 19, 1949. The Col du Galibier has been used in the Tour de France 31 times since 1947. The "Souvenir Henri Desgrange" is awarded to the rider who first passes the summit at every inclusion in the Tour. Henri Desgrange was director of the Tour de France from 1903-1940. Did you know that not only was Desgrange a sports journalist, he too was a bike racer and set 12 world track cycling records, including the hour record of 35.325 kilometres on 11 May 1893. He had a twin brother, Georges, born in Paris in 1865. Henri died of failing health after prostate surgery in 1940. He is known to have intentionally designed routes and rules aimed at making men suffer in the name of sport (or in the name of selling copy). He is said to have written a book on cycling training which included the advice "an ambitious rider has no more need of a woman than an unwashed pair of socks," (and that is the point at which I lost interest in reading about Henri Desgrange). 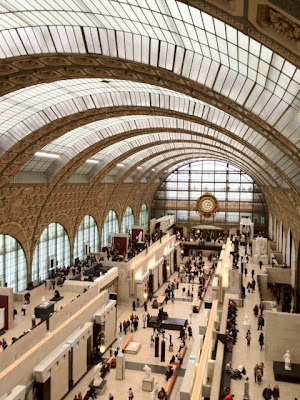 Located in Paris, the Musee d'Orsay opened in 1986 and is housed in the previous Gare d'Orsay railroad station, The museum is a favorite of many tourists visiting Paris who come to see works of art by Monet, Manet, Degas, Renoir, Cézanne, Seurat, Sisley, Gauguin, Van Gogh, and so many more. The museum is located on the left bank of the River Seine (the Louvre is on the right bank). Over 3 million visitors a year walk the halls of this museum, the cost is 9€. The museum is closed on Mondays, but is open 9:30-18:00 other days, and remains open late until 21:45 on Thursday evenings. Chances are if you have been to Paris, you have been to the Musee d'Orsay, and if you are in Paris on a hot day in July to watch the Tour de France, remember they air condition all 1 million cubic meters of air inside this impressive structure. 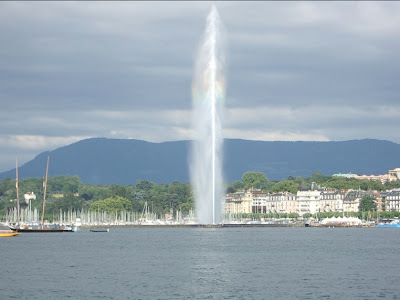 The Jet d'eau fountain on Lake Geneva, Switzerland, was built in 1951 and spouts 40 meters (459 feet) into the air above Lake Geneva. It is within constant view as you walk, drive, eat and drink along the shore of Lake Geneva. The fountain operates day and night throughout the year, except at nights in winter or in heavy weather conditions when the submerged pumps which blast 7000 liters of water into the air are shut off. You can reach the fountain by a stone jetty from the left bank of the lake, if you feel the need to be sprayed by lake water. Okay, tune in next Friday for more Guess Where travel shots. See all the previous posts in the new Guess Where series. Until next Friday, keep dreaming of travels.